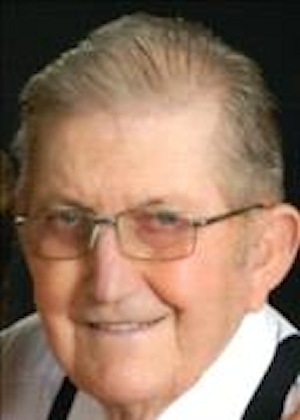 Obituary – Thiele, Paul Otto « Perry High School Alumni Association, Inc.
Paul Otto Thiele, 86, of Perry passed peacefully from this life on Friday, July 8, 2016. Services have been entrusted to the care of Palmer Marler Funeral Home of Perry and a service celebrating his life will be held at 10am on Wednesday, July 13, 2016 at Christ Lutheran Church in Perry. Public visitation will be held on Tuesday from 9am to 8pm with the family greeting friends at the funeral home on Tuesday from 6pm to 8pm. 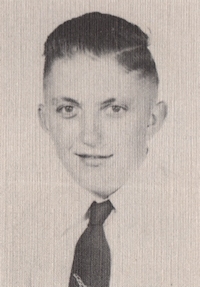 Paul was born on April 28, 1930 to Otto and Nena (Baetz) Thiele on the family farm east of Perry. He attended Pioneer rural school and Christ Lutheran School before entering Perry Public Schools. While in high school, Paul and his father purchased what would later become Paul’s farmstead east and south of Perry. Paul was active in FFA while at Perry High School and he earned the highest honor in the FFA program, The American Farmer Degree. He was also awarded the Honorary American FFA Degree for his lifelong dedication to both farming and FFA. Paul lived in Illinois for several years where he was employed as a meat cutter. In 1965, Paul walked into a café in Batavia, IL for coffee and walked out convinced he had met the love of his life, a waitress named Elizabeth “Jane” Millett. Paul and Jane were married in 1967 and, shortly after, they relocated to the homestead east of Perry where they have resided ever since. Paul spent 25 years as a feed salesman for MoorMan Feeds before retiring to become a full-time farmer. Paul and Jane raised cattle, wheat, sheep, and several children on their farm. When he wasn’t farming, Paul enjoyed traveling and introducing his children and grandchildren to the joys of the coffee shop, where Paul has been a fixture for nearly 5 decades. Paul was a kind man who never met a stranger. Paul’s two loves were his family and his faith. He enjoyed spending time with his family and traveled to IL as often as possible to visit his family there. He was rarely happier than when he was surrounded by his grandchildren and he love to go to their various sporting events and school activities to cheer them on. Paul was a lifelong member of Christ Lutheran Church where he was baptized and confirmed as a young man. He dedicated his life to serving the Lord and he served the congregation by acting as a member of the church Board of Education, as a Trustee, as a member of their Thrivent Ministry, as well as singing in the church choir. Paul had a smile that truly brightened the darkest of days and he fought to get the most out of his time here with his family and friends. Although illness may have made his last few months more difficult than he would have liked, Paul never complained and he never gave up his fight to spend just a little more time with his best-friend Jane. Paul Thiele was a loving husband, a caring father, a protective brother, and a proud grandpa. He made an unmistakable mark in the lives of many of his friends and acquaintances and he will be missed by all who knew him. Paul was preceded in death by his parents; a son Kern Thiele and a daughter Joyce David. He is survived by his wife of 48 years, Jane Thiele of the home; Daughters: Cindy Griffiths of Lake in the Hills, IL; Jennifer Thiele of Perry, OK; Shannon Bocox and husband Bill of Perry, OK. A son, Richard Thiele of Essex, CT. 13 grandchildren: Cindy’s children Candi Thomas and Daniel Fure. Richard’s Children: Adam and Christopher Thiele and Lauren Crimmin. Jennifer’s children Nena, Emma, and Zoe Kramer. Joyce’s children Jonathan David and Alicia Potvin. Shannon’s children Tabitha, Chandler and Carter Bocox. Two sisters: Joan Miller and husband Starling of Perry and Peggy Gottschalk and husband James of Perry. He is also survived by 11 great grandchildren and numerous nieces and nephews.